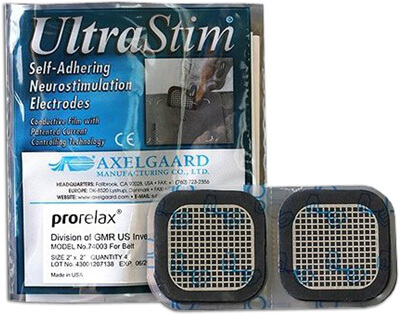 UltraStim Electrodes with MultiStick Gel distribute the current evenly comfortably, eliminating hot spots. Unlike conventional snap electrodes, Axelgaard Electrodes do not require snaps. They are a double-sided stick electrode and the Silver Mesh on one side is pressed against the snap on the garment. This provides for better conductivity… therefore no snap is needed. Just press the silver mesh side of the electrode over the same area as before.